Stupid grind-dependent achievements need to disappear from the gaming world. I think, under ideal conditions — such as players spending an obscene amount of hours using each character, it’ll be possible to get the max skills trophy without feeling the grind. However, I doubt that that’s the case for many. According to multiple Japanese walkthrough sites, skills unlock when characters reach certain levels. 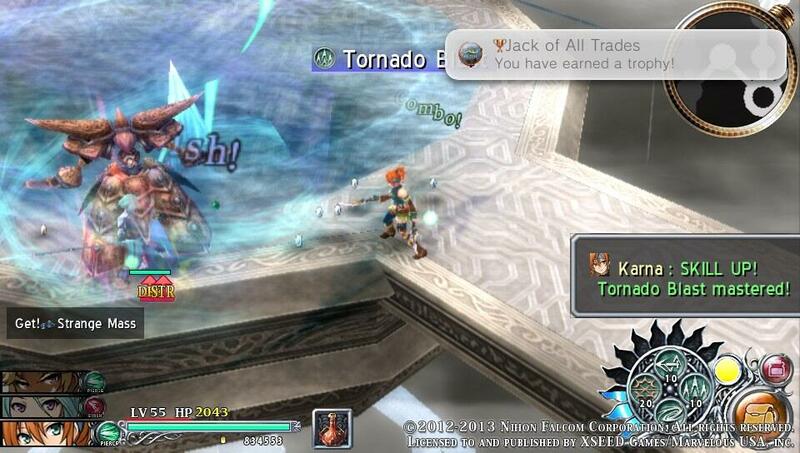 By level 50, Adol should have 12 skills and everyone else should have 10. Unfortunately, there is some other criteria that governs how they unlock. A quick Google search led me to a GameFAQs post where the author stated that obtaining skills is dependent on fighting tough enemies or enemies that are around your character’s level. There seems to be a consensus that beating up enemies in the final dungeon is a pretty good way to get any missing skills. I wonder if attacking Foria-Daros will also cause them to unlock as well? The thing is level 59, after all. Anyway, regardless of the method, I still hate these kinds of mindless trophies. There’s no real sense of accomplishment. In fact, all I got out of it was relief. 😛 I mean, even with the Warrior Seal IV (which boosts skill EXP gain by +4) equipped, it STILL took a chunk of time. (Not sure if it took over an hour since I play on and off. :P) And all I did was rotate between characters, hold the R button + mash the respective button for the skill I wanted to level up over and over until the notice that it was mastered appeared. If I wasn’t going for the Platinum trophy, I wouldn’t have bothered with this at all because it’s a really idiotic “achievement”. I just got finished getting the platinum trophy for the English version while following along with your Japanese run of the game lol. I decided to to check out what you’ve posted recently and of course your playing the English version now too. I did a new game on nightmare however. I’ve actually been going through all the Ys games on nightmare for the achievements. It’s pretty ridiculous at times let me tell you. At the beginning, practically every enemy can kill you in one or two hits. And don’t get me started on the bosses. Flash dodge and guard are life savers. I’m playing the english version now. I agree that these type of trophies aren’t very fun to earn. Thankfully you said we don’t actually have to hit enemies for the skills to gain experience.